It wasn’t that long ago that after being fed up with just catching pin whiting and slugs (rockling) session after session, I said I would pack up fishing proper until the start of April. Anyway, I just couldn’t resist the lure of the beach, so last night found me at Seaford with rod in hand – if you’ll pardon the expression. 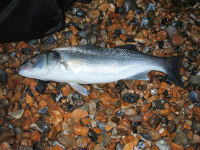 I got there at about 8.30pm to fish the tide up to the 12.40am high water – big tide too at 7.2m. Conditions were less than ideal, a flat, oily calm sea which was as clear as gin. No wind at all, not even the slightest breath of a breeze. To cap it all off, the sky was crystal clear with a big and very bright moon. I had decided that to avoid whiting and slugs, I would stick with my plan of all or nothing and fish just one rod and use large launce (sandeel) for bait. So a long link running ledger with a 4/o pennel was setup. The hope was for any bass that might have been around – although deep down, I really didn’t expect to snag one. After about 30 minutes, the rod tip pulled down slightly and then just started nodding away. I struck and retieved a small dogfish of the lesser spotted variety any potential blank was thus saved. Unhooked and retured, the stupid fish swam back to the waters edge and was promptly stranded. Why do they all do that? Half an hour later, another one hit the shingle, was unhooked and released for it to do the same – weird. The rest of the night was spent equally between standing there doing nothing and unhooking dogfish. They weren’t there in plague numbers but just enough to keep things ticking over. It certainly beats the persistant rod tip rattling and constant reeling in of tiny whiting and slugs. I packed up at about 2.30am with a final tally of 11 LSD’s. Considering I wasn’t expecting much, it turned out to be a pretty good session. Another joy was being able to fish without having to wear my floaty suit, just the salopettes and leaving the jacket in the car. It wasn’t by any means warm but it wasn’t too cold either. 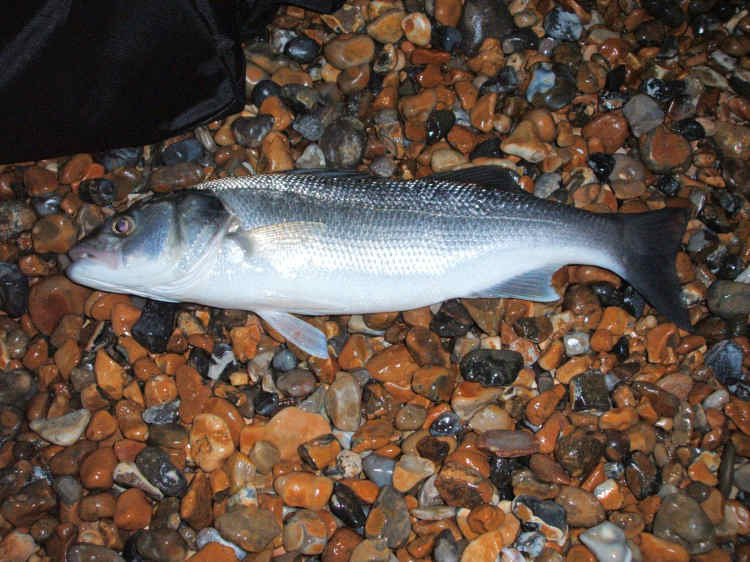 It was back to Seaford beach again last night for more bass hunting. I arrived at Edinburgh Road at about 8pm to fish the flood tide up to high water at 1am. The weather was low heavy cloud with a light Westerly breeze. Not long after arrival, a heavy drizzle/light rain came in, which managed to get all my gear nicely soaked but only lasted an hour or so before clearing out top leave a very pleasant evening. The sea was flat with very little in the way of wave movement – but the good thing was there were very few signs of the weed which would make things easier. I hadn’t been able to get any lugworm, so had to rely on some peeler crab I’d obtained and launce strips for the scratching rod, which I set up with a DVice on a running ledger. I cast this out with the launce and set about getting the bass rod all ready for when the sun had gone down. The rig was, as usual, a long link running ledger ending with a 4/0 pennel setup baited with the lovely large launce, I had managed to get from The Peacehaven Angler. When I returned to the scratching rod, I saw that there was loads of slack line, so retrieved it only to find a mackerel had taken the bait on the bottom – more bait! Apart from that, there was no other interest shown in the offerings I was chucking out. As darkness fell, I swapped the launce for crab on the scratching rod but this only resulted in more whiting in the same bracket as the previous night – all pins. Once the crab had been used, I went back to some mackerel strip instead but again this only produced whiting. The first proper action didn’t happen until about 11.15 when I saw a small pull down on the bass rod which resulted in a schoolie bass of about a pound. This was just after I’d spent a good while talking to another guy who had been fishing further along. The next fish was at 1135 and was a better fish at 2½lbs which had really punched above its weight, giving a really good run and dogged fight which had me believing it was something a bit bigger. It was a nicely conditioned fish, lean and fit. It wasn’t until an hour later that I had the next and last fish of the night, another schoolie of around 1½lbs. After this, it went completely dead with no further indications of any sort. I had anticipated at least one take during the hour period after high water but there was no interest shown at all. I gave it until 2.30 before calling it a day and heading for home. All three bass were taken at a range of no more than ten yards out. I think this is something people should bear in mind when targeting bass and should give confidence to those who are not great casters (myself included) and who perhaps try too hard to get those ‘extra’ yards. It’s not always about distance. I’ve been eager to carry on with my launce trials for bass at Seaford beach but was dealt a blow yesterday when I could only get smaller sandeels. Not to be put off, I decided to go in the evening anyway, so armed with a couple of packs of frozen sandeels and some lugworm, I headed off for Seaford. I arrived at the Edinburgh Road parking area at about 7pm and walked over onto the beach to be greeted by a fresh Westerly wind, whipping up quite a lumpy sea with large breaking waves on the beach. I could already see rafts of weed in the nicely coloured water but it didn’t look too bad provided there wasn’t more of the damn stuff unseen lurking under the surface. Fished two rods, one with size 4 two hook sole rig baited with lugworm, the other a long link running ledger with a 4/0 pennel rig with the sandeel. The worms were sent out about 40 yards and although I didn’t expect much on the other rod during daylight, I cast it out anyway to see if anything was around. Before it got dark, I had a small gurnard and two schoolie bass on the worm and nothing on the sandeel. Once darkness fell, it was a whiting fest on the worm – virtually a double shot of the bloody things every cast; all of them pins and nothing of any decent size. It wasn’t until about two hours before high water that I had the first hit on the bass rod – a huge pull down and screaming reel but I missed it whilst doing an impression of Billy Elliot as I tripped over the tripod. 10/10 for artistic impression but ‘nil point’ for results. Had another take on the bass rod about 20 minutes later and this time I connected and landed a plump bass of about 2½lbs. Missed another take about 10 minutes later through inattentiveness and that was it for the rest of the night. By 11pm the wind had died, the sea calmed right down to a swell and it remained fishless until I packed up an hour after high water. 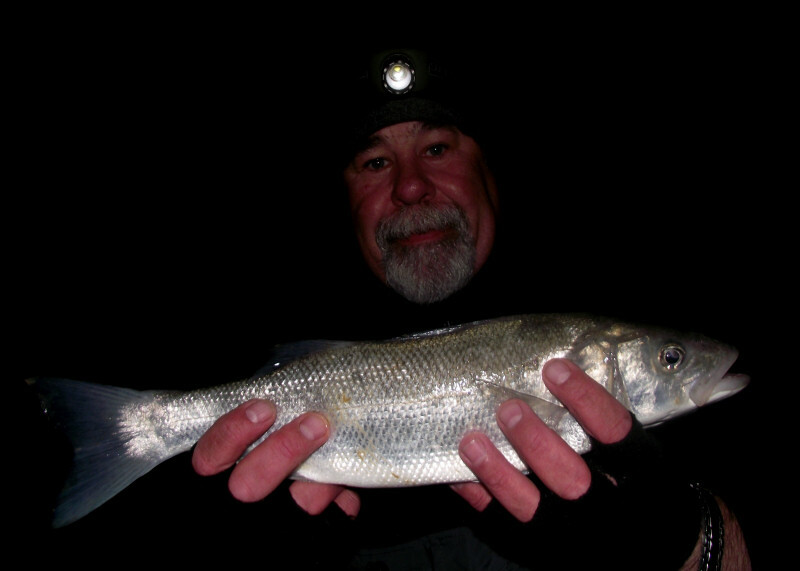 I’ve been eager to have another experimental session targeting bass at Seaford beach using only sandeel / launce for bait, so last night, armed with some large Ammo frozen launce, I headed off to see what I could achieve. I got to the beach at about 7pm, unloaded the car and walked across the shingle to a spot between the Beachcomber and West View. I was greeted by a mainly moderate sea with a bit of a swell which resulted in some nice wave action. Wind was minimal and when mild gust did come, it was from the West. I set up the ‘experiment’ rod with a long lead link, running ledger with a 6′ trace terminating in a 4/0 pennel. I mounted the launce on the hooks and lobbed it out into the waves. I had brought another rod to see if there was a codling about, so set this up with a DVice on a running ledger baited with lugworm and squid. I cast this out before returning to hold on to the bass rod. 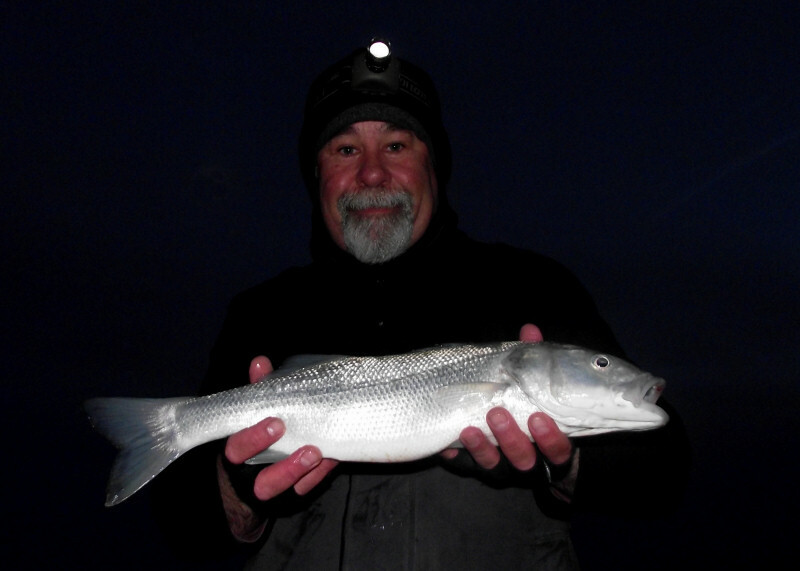 First fish of the night came about two hours before low water and was a nice fat whiting of about a pound. This was soon followed by another of identical size. While dealing with this second fish, I heard the other reel give two sharp tugging runs but by the time I got to it, there was nothing there. On retrieval, the sandeel had been absolutely smashed and was in tatters. Both rods were rebaited and cast out again. At low water, I felt a huge take on the bass rod and lifted into a fish. as it it slid through the waves, I could see that it wasn’t the expected bass but a decent sized whiting. From then on, it was a long succession of whiting, some were good table size. It wasn’t until about 3 hours before high water that the bass seemed more confident and were hitting the launce hard with long, ragged runs. None were huge, all being in the 2-2½lbs range but good fun all the same. all were taken just behind the first breaker in the turbulent water, no more than 10 yards out. I missed several runs through not being attentive or when I left the rod in the rest while dealing with the other road. Now I know that when bassing, you should only use one rod and that it should be held at all times but I can never resist the temptation to have another rod out for anything else that may be around. If you play it this way, you will pay the price and may miss THAT fish. By 2.30am, I had run out of bait and so with a couple of hours of the flood and hour of the ebb tide left, I had to call it a night. It was not an amazing night but it was enjoyable one with a total tally of five bass and many whiting. Next time, I’ll make sure I have enough bait to see me through.